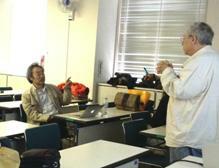 Class was a lecture by Masanori Tatsui. 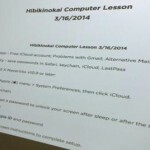 We talked with Hibiki computer teacher Doug on Face Time in Boston. And he sang a song “Please Come Boston” for us. Photo: Face Time, Doug in Boston. One by one we spoke about spring. And we had a role-playing. Setting: grocery store. Kate is clerk at a store. Nobuko is customer. Nobuko came to buy a cake. We enjoyed. Participants:Makkun, Akie, Yoshikazu, Shigeyuki, Walt, Yuu, Sanae. Participants: Michael, Katsuyo, Yoshio, Kate, Akie, Yuu, Sanae. Today’s teacher: Walt, Masanori. Supporter: Doug. And English song of this week is a request of Katsuyo. “What a Wonderful World” _ Louis Armstrong. 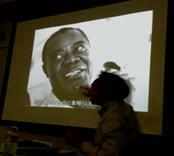 Photo: Louis Armstrong on the screen. 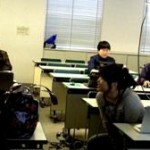 Today’s teachers: Doug, Akiyuki, Kim.